So, today, we will focus on Eccentric Muscle Contractions. An eccentric contraction is exactly the opposite of a concentric contraction. An eccentric contraction is the lengthening of a muscle while it's still contracting. When you put milk back in the fridge, it's the bicep that is slowly controlling the descent of that milk. The triceps is not pushing the milk into the fridge, but rather the bicep is slowly allowing the arm to fall to put the milk down. This is the same thing as performing ‘negatives’ in the gym. Such as during a bicep curl when you slowly lower the weight to the starting position over 10 seconds. That is an eccentric contraction of the biceps (and other elbow flexor muscles). There are series of concentric and eccentric contractions that happen, and in between those are isometric contractions (I’ll get to this later). Like I have mentioned before, the end goal of all those muscle contractions is to create tension. When you create tension through the body that's how you are able to transfer force from the ground all the way up through the core and then eventually into the ball. 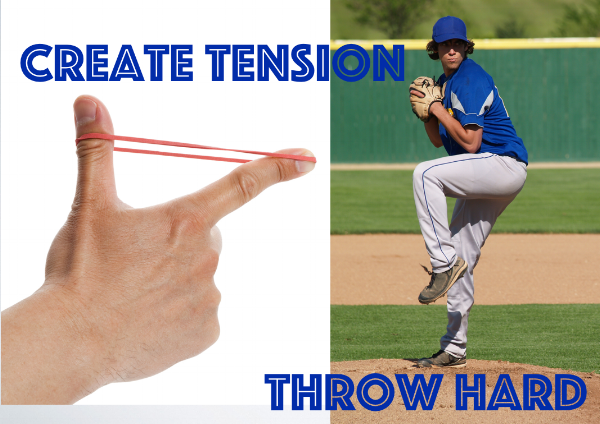 How much tension is developed and how fast you create that tension over all the links determines how much acceleration is imparted on the ball…and that directly impacts how fast the ball goes. That creates velocity. Imagine trying to fling a rubber band across the room. How much harder would it be to get good distance using a dried up, old rubber band compared to a new stiff one? Pulling half-way back on the band compared to really stretching it back before you let it fly? Since the stride leg kicks off the chain of events I'll put the focus here. For if we did not, everything else down the chain would be affected negatively. If any one of the preceeding links in the chain is not strengthened up to par, in the exact way it works while performing a pitch, everything down the line will take on more stress and strain and has a greater chance of creating an injury....and will surely decrease pitching peformance. ...and thats's only from a strength standpoint. We haven't even gotten to flexibility yet. One of my favorite exercises to eccentrically strength train the stride leg glute is with a Single Leg Romainian Dead Lift, often abbreviated as an SLDL or SLRDL. I would do this exercise at least 2x per week 2 sets of 10-15 reps. Go heavy enough to challenge the glute, but having correct form is of utmost importance. If this is too difficut to perform on one leg, hold a weight in both hands and do this on 2 legs (don't try rotating if doing on two legs). Imagine a pole that goes directly through the side of one hip, and comes out the opposite hip on the side. You want to think you are hinging around this pole. Your back stays flat as you 'bend' or hinge around this pole. This is the start of eccentric training for the throwers body. There is much more to be done, but consider this your base. Interested in learning more? Join a like minded group of people over on our private facebook page by clicking the button below. We'd love to have you. Think a friend would like this information, please share it with them.